The Martial Art Brazilian Jiu Jitsu specializes in ground fighting techniques and submission holds involving joint-locks and choke holds. The assumption is that the stronger, larger, and more powerful opponent will have the advantage, however, the Jiu Jitsu Martial Art is about using your opponent’s energy against them. Reckless power and speed will wear out the untrained opponent while your skill and technique will over come the power. Brazilian Jiu Jitsu is an extremely effective Martial Art for self defense. GREENWOOD Jiu Jitsu ‘s learning process focuses not only on the physical learning experience of the jiu jitsu martial art but also the mental and emotional aspects of martial arts. Effective self defense utilizes not only physical skills but mind and body skills as well. Mental and physical training is part of your learning experience. The best defense is always effectively defusing a situation before it elevates to a physical confrontation. Unfortunately, all situations can not be defused and physical defense may be your only option. This is a reality for all genders and age groups. Our primary program is focused first on your self defense. As you move through the various skill levels of the jiu jitsu martial art, you will learn that the jiu jitsu martial art is not only one of the most effective self defense martial arts but also a devastating offensive martial art. GREENWOOD Jiu Jitsu trains many individuals that train and compete at all levels for the love of the art and welcome you as a new member of our family. However, we hold a special place and commitment to children and those most vulnerable to predators and bullies. Every parent wants to protect their children, however the only way to truly protect your child is to teach them how to protect themselves. Young children do not want to learn, they want to play. At Greenwood Jiu Jitsu we have creative classes that combine Martial Arts games with real techniques allowing kids to learn while having fun. Most Toronto Martial Art schools focus 100 percent on one art. Our kid’s Brazilian Jiu Jitsu Martial Art program will provide your son or daughter with the tools needed to deal with a self-defense situation. Brazilian Jiu Jitsu doesn’t promote violence as there is no kicking or punching involved. However it’s important to know the difference between Sport Brazilian Jiu Jitsu and what can be applied in a self-defense situation where rules are not applied. We offer a special martial arts class that combines jiu jitsu with striking to allow kids to learn how to defend themselves while someone is throwing strikes at them. The Striking techniques derived from Karate and Kickboxing, while the Throws and Takedowns come from wrestling. When looking for a Toronto Martial Arts school for your child it is important that the martial arts fundamentals are taught in a fun and safe environment for your child to learn in. It’s really about teaching them skills to defend themselves. The first line of defense is achieved by children developing life skills and growing their self-esteem and confidence levels. All students must start in the Brazilian Jiu Jitsu program until students demonstrate self control and understand how to train safely. This martial arts program is designed so students can apply their jiu jitsu martial art while under pressure situations. We hold personal safety in the highest regard. We never engage in reckless or careless practices and any child who can not follow this will not be allowed to take part in these classes. Martial arts, when properly focused on self defense & the non-violent philosophies behind it, helps kids be confident, aware, focused and they learn self respect and respect for family as well. Bullying can affect a child’s self-esteem and confidence. Forms of Bullying can be Physical, Verbal, Humiliation, Social, Excluding others, spreading gossip or rumor’s and making others look foolish. Bully proofing kids is not all about the physical confrontation and the use of force. In bully proofing, kids learn the psychology of an attacker and to use physical force as a last resort, and only when the need arises. To bully proof kids, it requires instilling new knowledge and skills in handling situations unfamiliar such as confrontations and more. Things that are simple knowledge to us as adults about bullying will be life saving for your child if its drilled into there heads. Recognize the type of bully you are dealing with. Work your way around the bullies. Show minimal reaction to bullying. 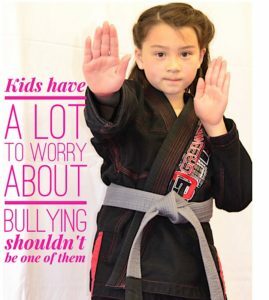 Good martial arts instructors will teach children non-violent solutions to bully avoidance. This will include strategies to talk and avoid a confrontation and instilling confidence in your child that they do not have to resort to physical confrontation to deal with the bully. The goal is to discourage bullies by the potential victim resisting the verbal assault and taking away the control and emotional pay-off from the bully. With no gratification, the bully will be less likely to choose them. A proper Toronto martial arts school will have a policy in place to protect the children that attend, however it’s not just the policy it’s the whole mental and physical training that is important. One that has the potential to fight back, is aware and not an easy victim will probably not be chosen. Martial Arts tactics that are taught include avoidance, appropriate verbal exchanges, neutral/confident body language and facial expressions, selective ignoring and self-control. Physical confrontation is the very last thing on the list. Bullies are looking for the nerve that makes any individual react. If a child can hide their emotions then they are well on the way to counteracting the bully. Once a bully discovers a victim’s weakness, they will do it again and again to see the same reaction over and over again.